Just eleven months after the urban75 forums registered its 11,000,000th post, the Brixton-based, community-funded bulletin board has now notched up its 12 millionth user post. 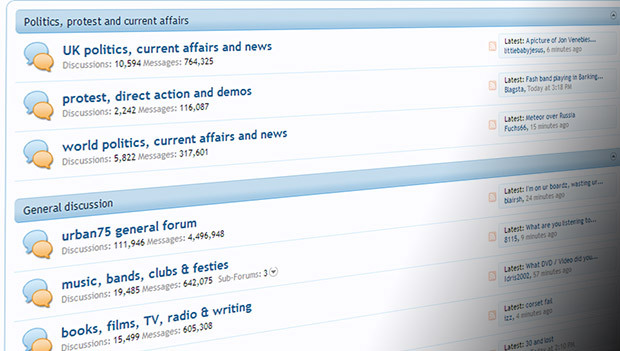 Boasting over 44,000 registered users, the site offers over 30 themed forums, covering a wide range of topics from politics, protest, football, music, film, local issues, transport to knitting and cooking. The original forums date back to 1996, although they were rather basic affairs running on steam-powered Perl/CGI-powered scripts that formed an irresistible magnet for unhinged posters to try and mess up. Over the years we switched bulletin board software several times, moving to the excellent XenForo software in August 2011. The current post total is actually considerably lower than the actual figure, as in the past we had to delete hundreds of thousands of posts to conserve precious server space. 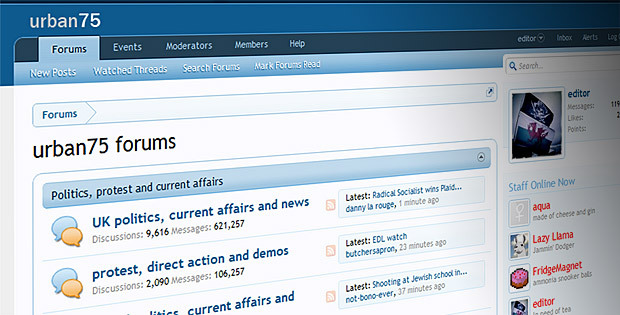 Over the past year on the boards, there’s been 30 million page views, with the most popular forums being UK politics, current affairs and news, the general forum, health, relationships, sexuality (open to established registered users only), the Brixton forum and world politics, current affairs and news. The bulletin boards are -rather unusually – totally funded by users who donate anonymously (and thus get no added privileges). Here’s to the next million posts! Read more about the background to urban75 here. Good to see the place so healthy.